Are you swimming correctly? Believe it or not but most people aren’t. By tweaking your technique you will swim faster, reap greater fitness rewards and altogether find it more enjoyable. The health benefits of a regular swim are well known. Amongst other things it can provide a great cardiovascular workout, tone the body and strengthen the heart muscles. It is also championed by physiotherapists as the best exercise for people with joint ailments or injuries. What is not so well known is that this is only true if it is done well. According to recent research, of the estimated 12 million Brits that regularly swim a massive 98% are estimated to have poor swimming technique and are making no gains in aerobic fitness as a result. Bad swimming techniques can not only hamper fitness progress but also spoil enjoyment and even result in injury. If swimming is being used for its therapeutic value then bad technique can aggravate existing injuries and create new problems. Some common mistakes by recreational swimmers include hunching the shoulders in breaststroke, which creates bad posture and shallow breathing, holding the head too high in front crawl, which strains the neck and back muscles and the lack of hip rotation during backstroke is a cause of pain in the neck and upper back. Often all it takes is a few modifications in improving your technique to radically reduce the risk of these problems. Unlike most sports where regular practice yields improvements, swimmers can splash away for years without really getting any better. The key to improvement is good technique. To help assess the quality of your current technique and suggest potential improvements, we’ll present some basic tips on swimming technique. To start you off we’ll look at improving your front crawl. For streamlined movement through the water and minimal drag, the body needs to be completely flat from head to toe, and also parallel with the surface of the water. A common mistake is keeping the head too high resulting in the legs being too low in the water. Although the body should be flat it shouldn’t be rigidly flat in the water but instead rotate lengthways as you swim. A common misconception with front crawl is that a lot of the propulsion comes from the kicking legs. The key role of the legs is actually to help balance you rather than propel you along. 80% of the body’s work comes from the back, shoulders and arms. 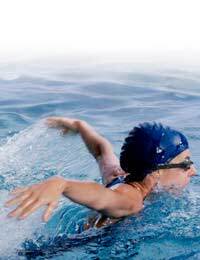 Good forward motion in front crawl is better achieved by getting a decent hold and pull in the water with your arms. The body should therefore be stretched out to enable the pulling arms to reach out as far forward as possible to pull in the greatest amount of water. This technique highlights the fact that decent swimmers don’t cover distances faster with faster strokes, but by travelling further with each stroke. The fewer strokes you take per length, the less energy you use up. Good timing is crucial in swimming. Legs, arms and a head that are working in regular harmony with one another will help you to maintain a streamlined shape, maximise your distance per stroke and allow you time to breathe easier. For efficient front crawl your arms should be working in direct cooperation with one another rather at odds, with one hand entering the water as the other begins to pull. Poor breathing technique is a common problem for novice swimmers. A typical error is in keeping the head out of the water too long and upsetting the regular stroke motion. Once the swimmer has taken a breath whilst the arm is in recovery the head must be back in the water before the hand enters again. Usually the swimmer finds they are gasping for breath because they don’t have enough time to breathe in and out during this moment. Instead of trying to do both you should exhale whilst the face is submerged. To enable efficient breathing technique the water level should touch your head between your goggles and your crown. And instead of lifting your head out of the water when you breathe, you should be able to breathe in the trough that your progress creates. To give yourself a more balanced stroke it is also wise to try to breathe on both sides.